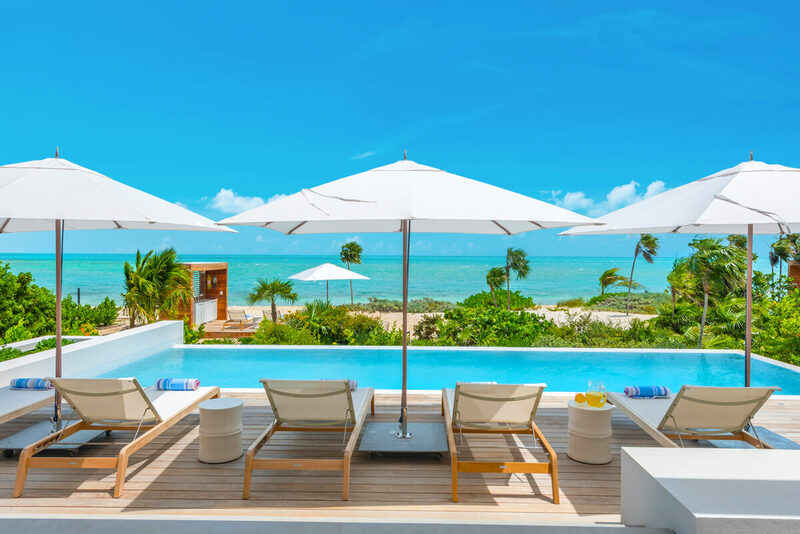 This beachfront villa is a great choice if you want to take your family to Turks and Caicos, and you want a bit more of a resort feel but still with privacy and space of a private home. There’s four king suites and a king/twin suite in the main house, plus a guest cottage with another king suite. The villa is part of a gated resort that has its own piece of the beach, fitness facility, water sports, and beach service. The staff is on-call, so you can be pampered as much or as little as you want! Beachfront Villa with amazing views! The Beach Enclave Beach Front Villa Plus 1 Bedroom Cottage has a modern design with sleek lines, exposed wood, and nonstop ocean views. This villa is enveloped in sunny gardens and sits seconds away from Long Bay Beach. White sand and turquoise waves are steps from the villa’s back deck. On the beach, guests can kite board, stand-up paddle board, or sunbathe. Beach Enclave’s partnership with KiteProvo offers guests kayaks, paddle boards, snorkeling gear, paddle snorkeling, and complimentary eco paddling tours through Turks and Caicos’ mangroves. Daily yoga sessions and a 24/7 fitness center are available at Beach Enclave’s Retreat center. The villa itself has a wooden sun deck with loungers, umbrellas, a barbecue grill, a fire pit, and an infinity pool. Al fresco dining tables sit by the pool and in the garden courtyard. Sliding glass doors open to the living and dining area, which is generously sized and elegantly furnished. High vaulted ceilings, neutral tones, and cool tile floors run throughout the air-conditioned interior. The living room has plush couches and a flatscreen Apple TV, while the adjacent dining table seats 10. Pristine white cabinetry and an oversized island furnish the kitchen, which is equipped with stainless steel appliances. A breakfast bar, blender, espresso machine, coffeemaker, and gas stove round out the kitchen’s amenities. All six bedrooms in Beach Enclave have neutral color schemes, ensuite bathrooms, and ocean views. Four bedrooms are upstairs, and one is downstairs. Three of the upper level suites have king beds, and two have balconies and outdoor showers. The fourth upper level suite has two twin beds that can be made into a king. The Garden Cottage is independent from the main house, and has its own veranda, kitchenette, and king suite. This villa is in Beach Enclave’s gated resort, which offers onsite reception, a water sports facility, a yoga and fitness pavilion, beach service, and on-call staff. The villa is only 10 minutes from the airport and five minutes from Grace Bay.